With a "Boundary hotspot” you can show an info-window in the virtual tour when someone is looking at a particular area in the tour. When on the “Edit” page you will find that the third option is the “Boundary Hotspot” feature. This feature enables you to create a boundary hotspot in your current location. By clicking on the blue “Add hotspot” button an item is created in the design menu on the left side. The new menu item will be shown in the list of menu items under the name “New hotspot”, which is the default name before you name it yourself. By clicking on the little pencil besides the item (named “New hotspot”), you can activate the text box and this enables you to edit the name of the hotspot (as well as add content to the info-window). The bin icon, which allows you to delete the boundary hotspot. The boundary hotspot links information, in the form of an info-window, to the boundary specified in the tour. The info-window shows what visitors see when they turn their view to the specified area in a location. The hotspot can contain text or buttons or, through hyperlinks, photos and video. Adding and changing content to an info-window works like any text processor. “Width (px)” enables you to set the width of the hotspot. “Position” enables you to choose where the hotspot appears. “Hotspot will not have a header”removes the header of the hotspot in the tour (in the figure below the header is displaying ‘New hotspot 1’. “Opacity” enables you to choose the opacity of the hotspot. “Global hotspot” makes that the hotspot is always visible when at this location in the tour. “Hotspot can't be closed” disallows the closing of a hotspot: the hotspot will always be visible. After creating the hotspot in the previous step it is time to define the boundary in which the hotspot should be displayed in the virtual tour. To set your boundary click the “View/Edit boundaries” button. You now see a shaded area in the tour that displays the boundary. Drag the left and right boundary lines (the red and green lines) to resize the boundary. After defining your boundary, click “Hide boundaries” and the boundary resize area closes. 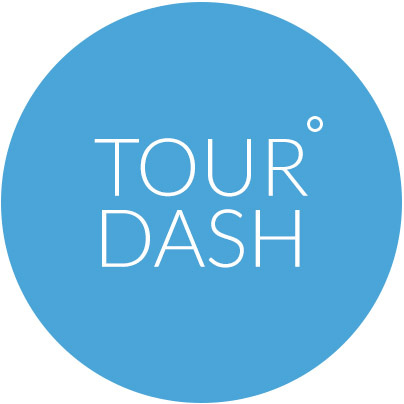 By clicking the plus icon TourDash offers the option of linking another area to the same boundary hotspot. This way multiple views can be linked to one boundary hotspot, which means less work when creating or changing the contents of the info-windows. Decide to which boundary hotspot you want to add another view. There will appear a sub-item with the name “Another view”, which you can rename. In the design menu all the boundary hotspots are shown. These are visible in the virtual tour when a visitor is between the specified boundaries.